In addition to our regular programming, this year we are going to offer a series of specialized workshops covering in greater depth some individual areas that our customers have expressed interest in. Each workshop will be 3 hours in duration and cost $30 per student. This will cover inspecting your cog set and chain for wear and tear. We will also include how to replace brake cables, housing, and shoes plus their proper adjustment. Additionally, we'll talk about the different styles of brakes and compatibility issues. 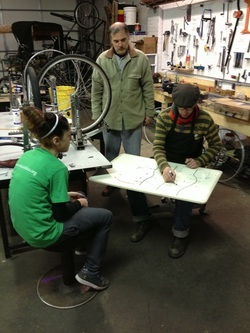 The shifting workshop will cover all aspects of your bikes shifting system. Included will be adjustments to shifters and derailleurs, replacing cable and housing, review of different types of shifting systems, and compatibility issues. Unravel the mystery of what's inside a coaster brake hub. Bring your own wheel or we can provide one as we pull it apart and clean and re-grease it. Have ideas about a class we should offer? Click here to let us know what your interests are.